James Boyer May put out a most valuable periodical directory in his Trace magazine, which basically indexed most of the little magazines published in America and in England on a yearly basis. Trace’s directory was an excellent resource for maverick authors such as Judson Crews or Charles Bukowski, who once claimed that “Trace has long impressed me as the only gathering ground for those of us camping outside the oligarchy of university wall.” Furthermore, Trace was instrumental in promoting the “littles.” Trace not only listed and publicized new little magazines at a time when they received little attention, but it also constituted a public forum where editors discussed their own magazines and encouraged readers to submit their work. Many editors believed that Trace’s contribution to the growth of the little magazines and its subsequent “revolution” in the 60s was invaluable, and they also considered that its public forum was pivotal in acquainting editors with one another to then create a series of literary networks that distributed alternative literature efficiently. 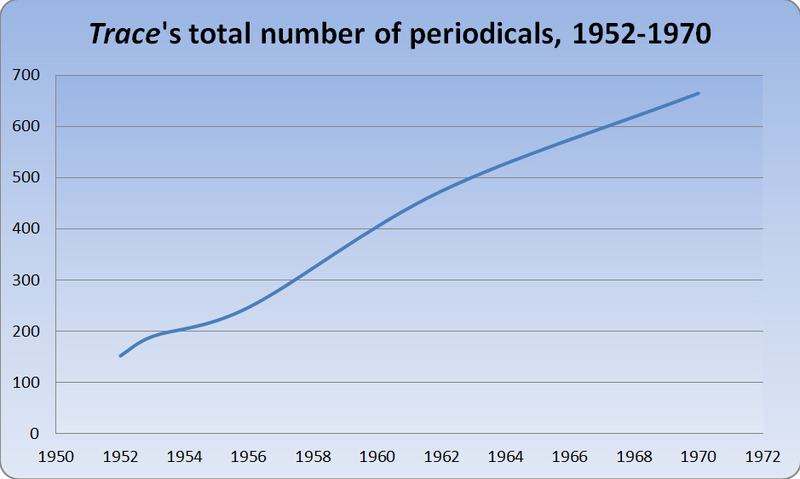 The graph below displays the total number of periodicals listed in Trace’s directory from 1952 to 1970. There were 190 magazines in the 1953 directory, and 665 in the 1970 one (Brownson 387). According to a different source, the 1952 directory had 152 magazines, and the 1956 one, 247; by 1963, there were 747 little magazines and small presses, and then they really took off and proliferated in greater numbers (May 383; Fulton 48), which would eventually led to the 665 “littles” listed in the 1970 directory -small presses were not included in that figure. The outpouring of little magazines during the 60s is evident. If it is taken into account that most “littles” were short-lived, the total number of magazines compiled in the 1970 directory is simply astounding as the great majority were probably new ventures. Brownson, Charles W. “Access to Little Magazines.” RQ 22.4 (Summer 1983): 375-87. Fulton, Len. “An Odyssey.” Green Isle in the Sea. An Informal History of the Alternative Press, 1960-85. Ed. Diane and Curt Johnson, eds. Highland Park, IL: December Press, 1986. 43-53. May, James Boyer. “On Trace.” The Little Magazine in America: A Modern Documentary History. Ed. Elliott Anderson and Mary Kinzie. Yonkers, N.Y.: The Pushcart Press, 1978. 376-87. Note: I strongly recommend visiting the James Boyer May/Amsberry Poetry Collection, University Archives & Special Collections, Pollak Library, CSU, Fullerton. The correspondence between May and the little magazine editors is a treasure trove of literary and bibliographical information for anyone interested in Trace and the literary upheaval of the 60s.